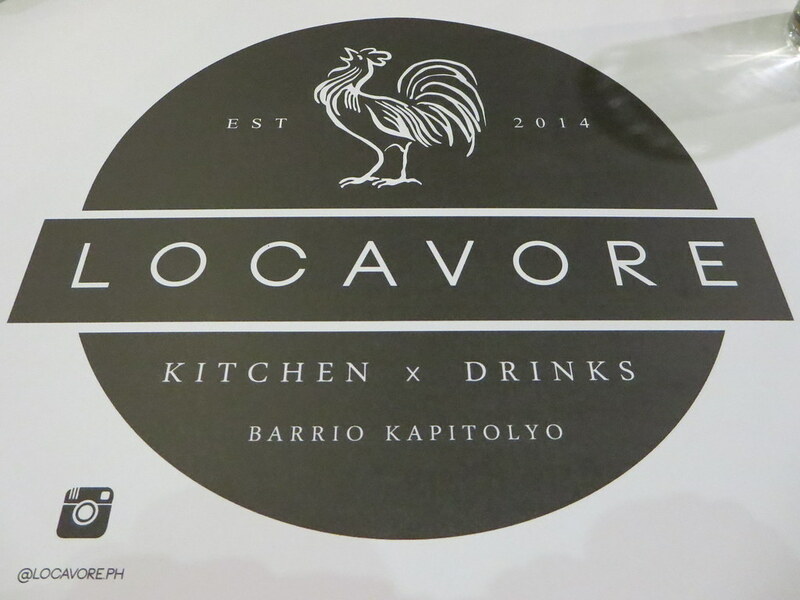 I heard there are a number of good restaurants in Kapitolyo so when T and I were in the area after watching the 2015 Under 23 (U23) women's volleyball in Ultra, we went to a Filipino restaurant called Locavore. Parking seems to be a problem in the area but the guard (I assume of Locavore) is so helpful that T immediately finds a parking space. T and I wait by the entrance of the restaurant for a host but when a few minutes pass and no one arrives, T and I just let ourselves in. According to Locavore's website, the name of the restaurant is actually a description of a diner who consciously eats food that is grown, raised, or produced locally. Food should not have traveled from too far away giving much more meaning to the phrase 'farm to table'. It's also nice to learn that Locavore supports local farmers and brewers. 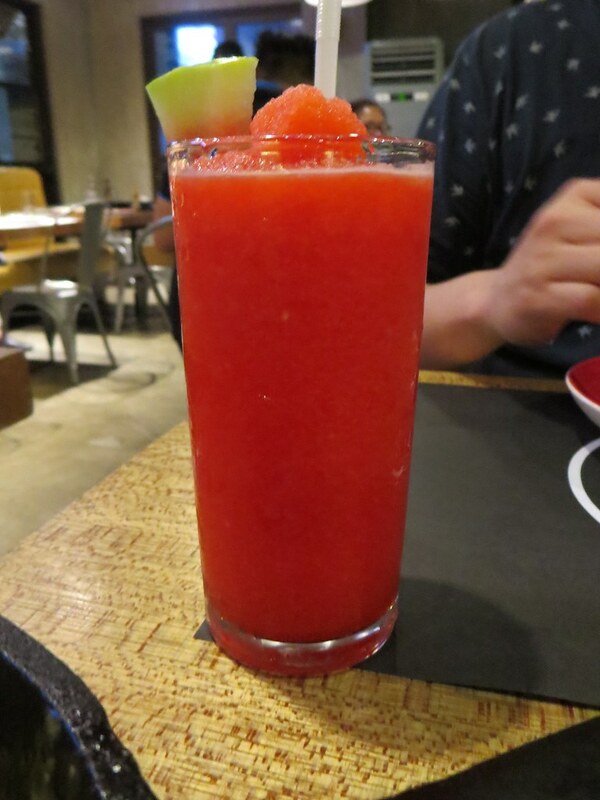 For his drink, T orders a Watermelon Shake. Under Pampagana (or appetizer), Gabi Chips (PhP135/$2.85+SC) catches my attention so I order it. 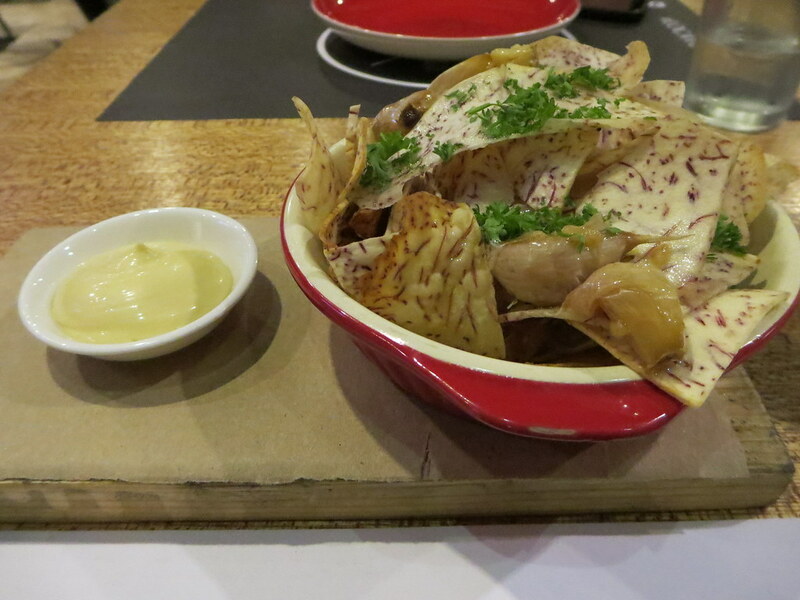 The labuyo aioli is so good and the garlic confit complements the crunchy chips. A must try. 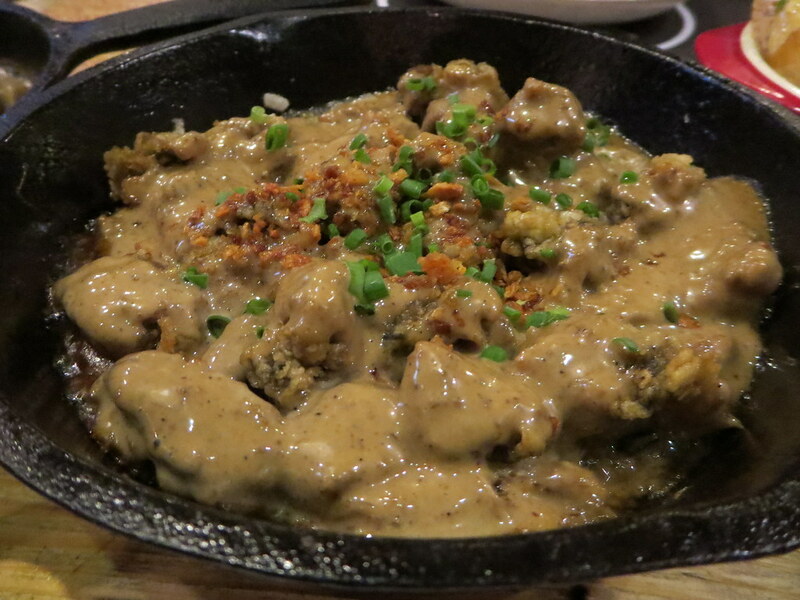 We also order Fried Oyster Sisig (PhP350/$7.50+SC). When T and I have a favorite dish, we rarely order it elsewhere because we don't want to get disappointed. Two Seasons Boracay has set quite a benchmark for the Oyster Sisig (read my blog post about it) but since we don't know of many restaurants which serve this dish, T orders this in Locavore. Verdict? Two Seasons' version will always be our favorite but Locavore's version is not that bad too. 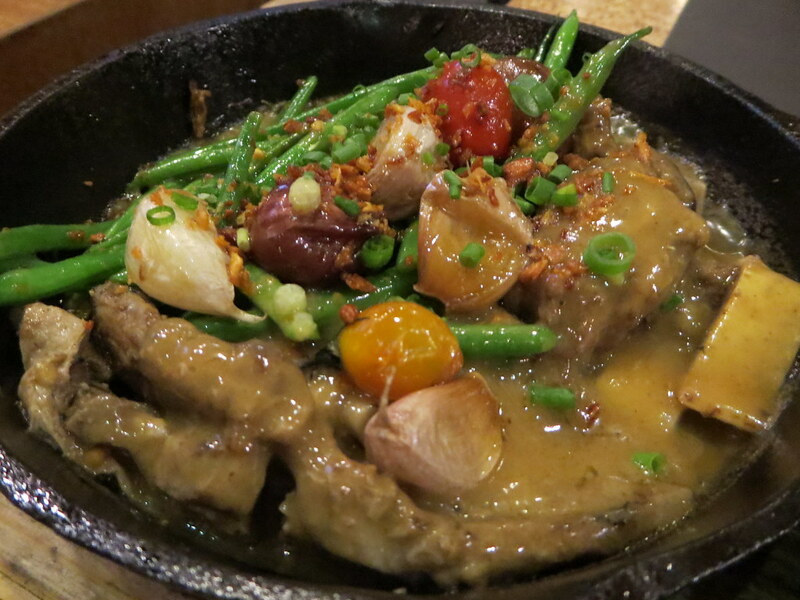 For our main dish, I order the Sizzling Sinigang (PhP475) which has beef short ribs, sautéed French beans, sampaloc gravy, and garlic confit. When the dish arrives, I am actually surprised that it doesn't have any broth at all. If I knew, I would've ordered something different because the composition is too similar to the Oyster Sisig that we ordered. 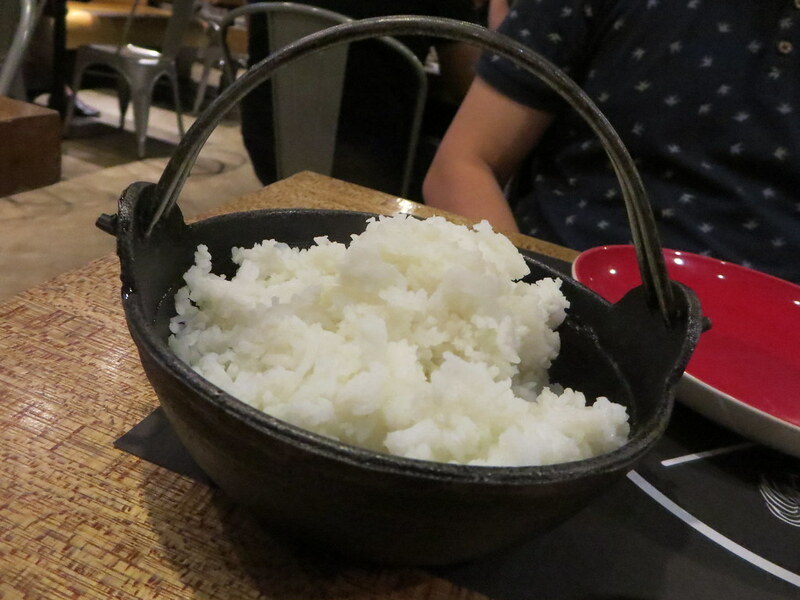 And due to the richness of the flavors present in all the dishes we ordered, Steamed Organic White Rice (PhP55/$1.20+SC) is a must. 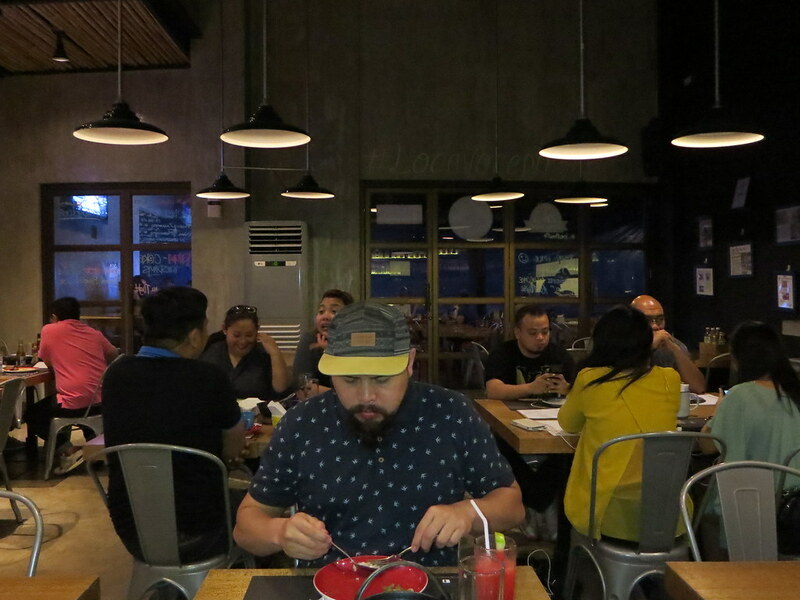 Spot T happily eating because it's not very often we eat at a restaurant serving Filipino cuisine (except for a few childhood favorites of mine like Aristrocrat). 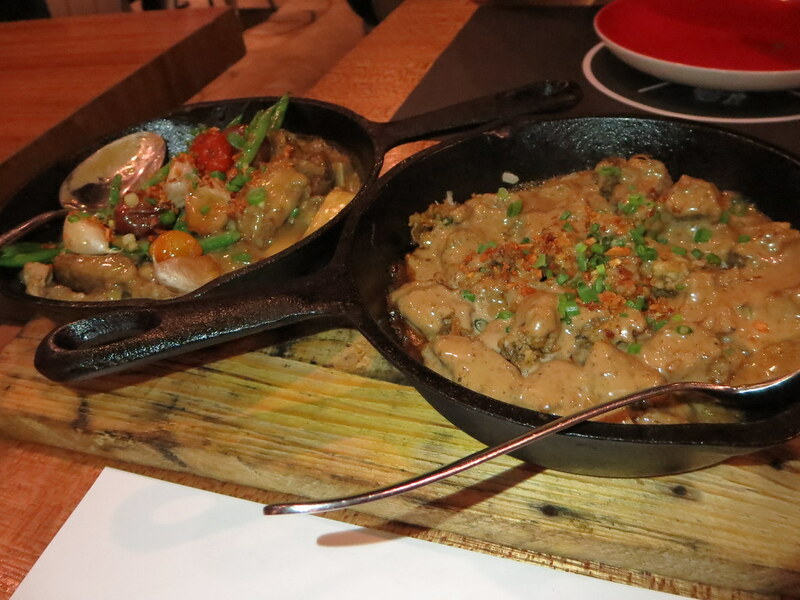 Good Filipino dishes with a twist. Very helpful guard when it comes to parking. Found the dishes a bit salty (just a bit). Tables are too close to each other and definitely not for those who have personal space issues. 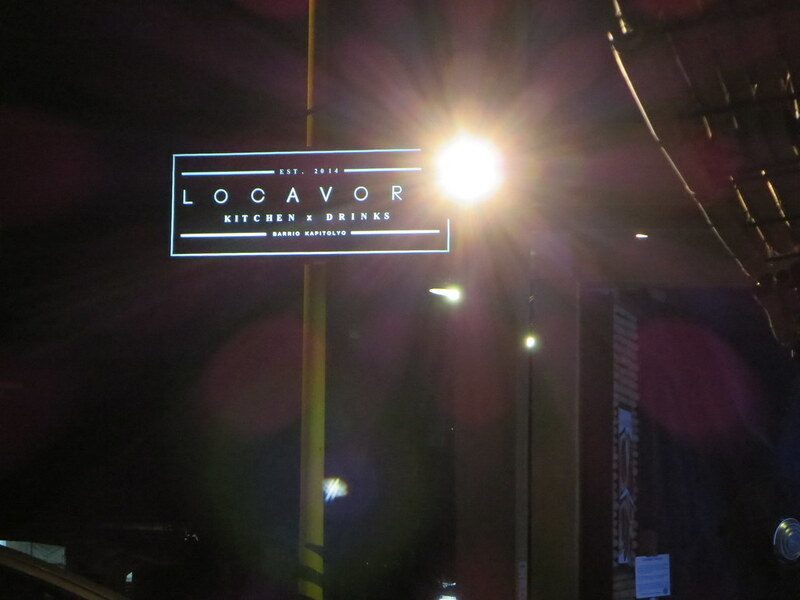 I usually crave for Filipino food only when I'm sick but I want to go back to Locavore to try their other dishes like the Chori Burger and Liempo Buns. I'm curious to know what day and time you were there...because I heard the place is usually packed. But based on your post, you didn't have to wait to be seated. Mother! 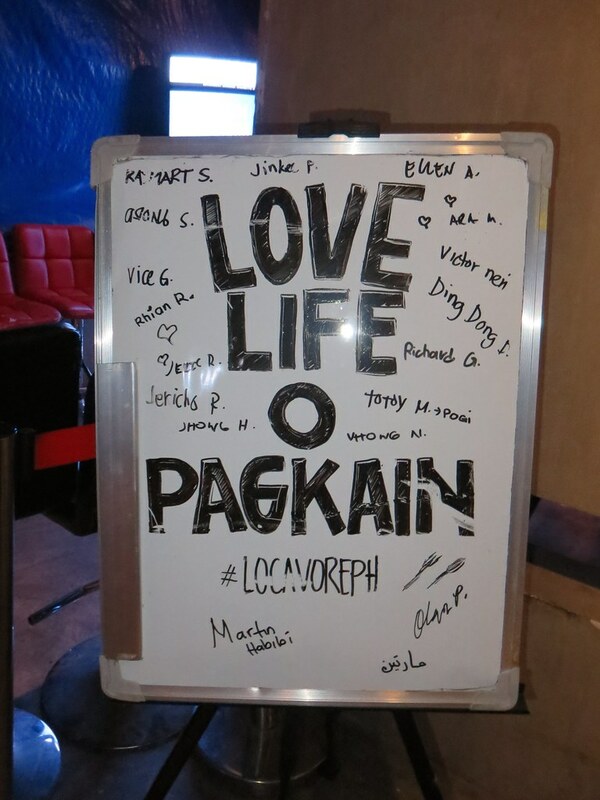 I loooooove Kapitolyo! Let me know when you're in the area again, let's meet! And yes, there are many good hole-in-the-wall finds there :) But 'yun nga, the spaces tend to be small for most of the restos there. Oh you're near Kapitolyo?? Would love to meet up! Heard there are a number of good restos here! !